eReader1: If you're thinking about buying a Kindle, WAIT! If you're thinking about buying a Kindle, WAIT! Seriously.... wait! I don't mean "Wait and reconsider." Rather don't buy for delivery next week: instead pre-order the new Kindle 3 and wait just a few more weeks for its arrival. Oh I know it's hard! When I bought mine last year I had enough trouble waiting on overnight delivery! It was like waiting for Santa to arrive. Worse, because I knew that I was definitely getting my favorite gift and I had to wait a whole t-w-e-n-t-y f-o-u-r painful hours. But.... Amazon have recently announced the latest 6 inch Kindle - sleeker, smaller, lighter, faster, sharper and with built in Wi-Fi! Yup, yup, all that at two fantastic price points: $189 with the regular free 3G PLUS Wi-Fi, and $139 if you just want Wi-Fi. I guess we're calling it Kindle 3 since it's actually a different sized device, although still with a 6 inch screen. The device itself has been made 21% smaller and even lighter than a typical paperback. So what else is new with the Kindle? Longer battery life. I already get 2 weeks from my battery, but the new model touts a whole month usage with wireless off and a couple of weeks with it on. Ooooo! That's great for the days when I forget to turn it off! 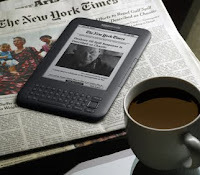 Sharper contrast: Amazon are boasting "50% better contrast than any other e-reader. The clearest text and sharpest images." More storage: holds 3,500 books. That's on top of Amazon's online backup of purchases from them, of course. Not one of my top 10 but I will throw it in: Quieter Page Turn Buttons. Um, I didn't know they were loud to begin with?? This is all on top of Kindle's already great feature base: 3G to download books anytime and anywhere, no sun glare, portable library.... If you don't already own a Kindle and want to learn more, check out my page "Why I Love My Kindle"
If you simply cannot wait until the launch of Kindle 3, then you can still buy Kindle 2, although apparently Amazon have currently sold out or have stopped selling them as they are listed as "This item is only available from third-party sellers" and "There is a newer model of this item". I won't be buying one immediately. I have until October to make the decision about buying a new one for myself and passing mine down, or to keep mine and buy my daughter a K3. I better not let her read this or she'll have 2 months to wear me down! I wonder when Target will be getting the new models for demo?? If you see one, please let me know! I have been considering getting one of these, but I just read so much from the library, and don't buy enough online, that I dont know if it would be worth it to me. Maybe once i get a better job and I can afford to buy alot of the newer books myself, but my library has great selection so there isn't a need for me to do it yet! But thanks for the info, I will keep it in mind. For us techno-dense Kindlers (surely I'm not the only one), is 3G really worth $50? What will it do that Wi-Fi won't? 3G works wherever you can get a regular cell phone signal; in this case, it would be AT&T signal. Sitting in a park, on the bus, on the highway as a passenger, in your backyard.... if you can get an AT&T signal, you can use Whispernet to download books or get online. WiFi, on the other hand, requires a more localized signal. It might come, say, from a wireless router if you use one at home. Coffee shops like Starbucks, hotels and other places often have free WiFi set up so you can get online with their connection. Often they are password protected, so you cannot just "hitch a ride" on say a neighbors wireless router. The upside of it is that it can be faster/ stronger than 3G, and since the wireless subscriber is paying the bill, not Amazon, you won't have the charges for any large personal document downloads. Ultimately the $50 extra gives you the ability to use Whispernet in many more places. But if you have a wireless router and you find you only ever need to download books at home, then the WiFi only would be just fine, I am sure.